An oasis in the heart of sunny Poipu, this quaint condominium complex is impressively landscaped with mature, lush jungle foliage. 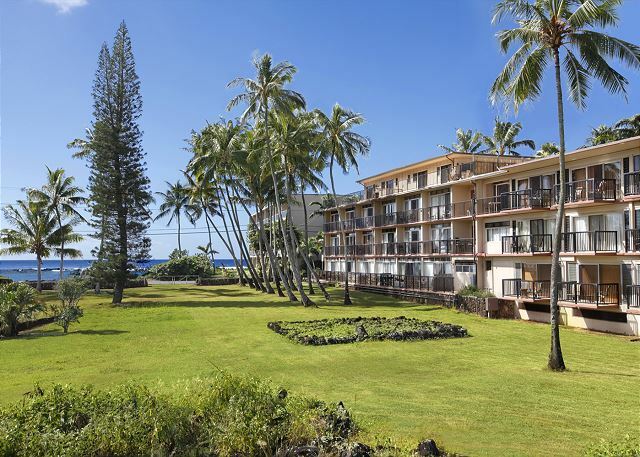 Right next to historic Prince Kuhio Park and just 30 yards from the ocean, you have discovered a gem within Kauai’s most popular vacation town! 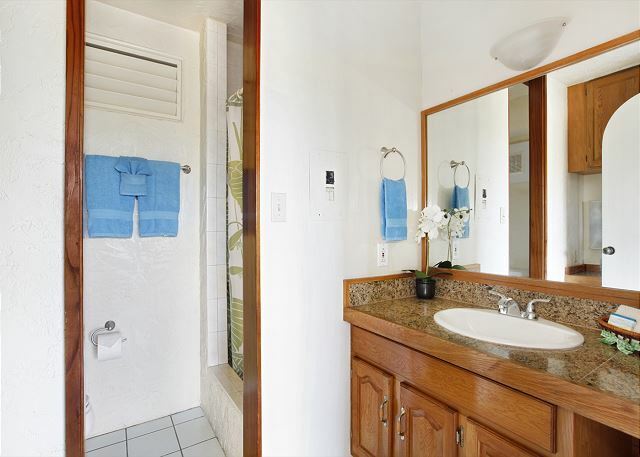 Kauai Prince Kuhio 315 is a gorgeous, one bedroom condo with ocean views, custom mahogany cabinetry & furniture. From your private porch, enjoy the serene sounds of rolling ocean waves, tropical song birds and palm fronds rustling in the trade winds. With direct access to a pool, the beach and town, all of your paradise desires will be easily satisfied. - Oceanfront condos at the best possible value. 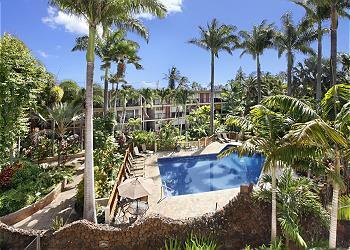 - Features a pool, tropical garden landscaping, easy access to world-famous snorkeling, swimming and surfing! - Located adjacent to Prince Kuhio Park, walking distance to Kukui’ula Shopping Center and just a minute’s drive to Spouting Horn and Allerton Botanical Gardens. 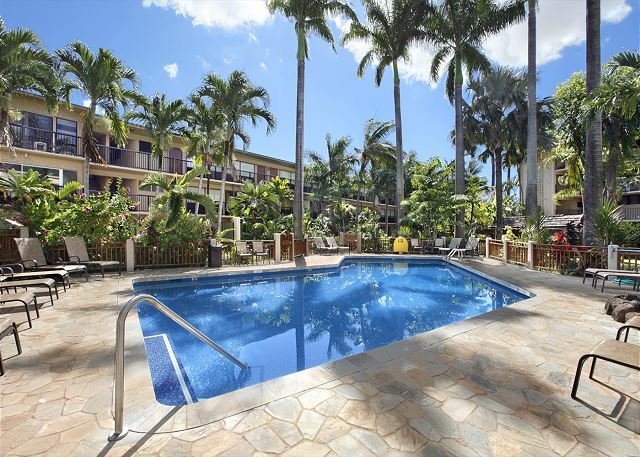 Spacious and clean condo with nice amenities - beach chairs, snorkel equipment, small cooler. Great snorkeling beach right across the street. Pretty grounds and great views of the park and ocean. Be sure to bring an eye mask and ear plugs. The sun is blindingly bright in the bedroom in the morning and the roosters can be loud, but we were prepared and it didn't detract from the stay. - None of the windows block sound. The neighborhood is pretty quiet but when anyone is outside you can hear them. The unit was large, clean and well accommodated with everything you need, including a nice selection of beach gear. 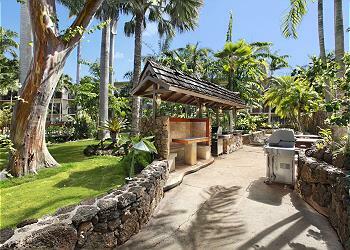 Great location, just across the street from one of the best snorkeling beaches on the island. Good restaurants nearby. Would certainly come back. This unit is so clean and perfectly located in Poipu. The bed is very comfortable, the kitchen has everything you need and the on-site concierge was great. The view is great with a large balcony to enjoy breakfast and the beautiful sunrise. I would highly recommend this unit to everyone. We know Kauai very well, and for the price there is no better unit on the island. 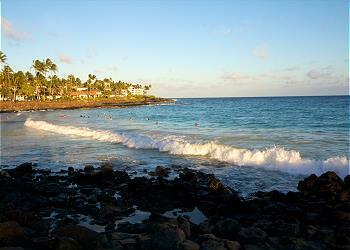 Just check in and relax to enjoy the beauty of Poipu. Our online booking and keyless entry were easy- our condo was impeccable with a very well equipped kitchen and comfortable beach chairs. The rooms were much larger than we anticipated so we could "spread out" and relax. 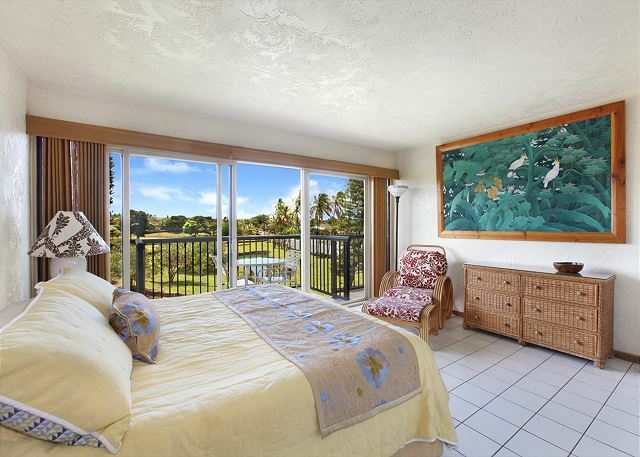 The main bes was comfortable and although no air conditioning you could sleep with the doors to the lanai open. Woke up in the morning to the sound of roosters- wonderful, this is Kauii!Choice of parking was good -either near condo or a short walk past the pool to undercover parking.We enjoyed afternoon drinks across the road at the oceanside bar. It was super easy to check in to the rental. I was emailed a door code that would not work until time of check in. No need to track down someone to give you a key. That being said, there was no one physically around to help you if you had questions or anything. There's an "office" that you walk in and grab a parking pass. There is a laundry room but it's only open 8am-8pm. I woke up every morning around 6am due to the loud roosters and parakeets and really wanted to get laundry done during those early hours but could not access the laundry room. By 8am, my husband and I were already on the road exploring and didn't return until 7 or so each night so there was never an opportunity to do laundry. In addition, the unit we stayed in was spacious but very dated. I didn't realize there wasn't A/C until we arrived. I didn't bother to check the listing before booking because I assumed it was included. Most of the time it wasn't an issue, as long as you open the patio door. The shower could have used more space shelf. There was this tiny little shelf and my shampoo and condition both fell off of it and busted open on the ground. On the plus side, the rental came with some useful items such as: cooler, beach chairs, pool towels, snorkles, cookware, Tupperware containers and extra hygiene products. This property is very clean. It is within walking distance to restaurants. Management was very helpful. Our Pin was not working due to a dead battery. Kalo responded to our texts immediately and came to the property and fixed the issue. Very quiet. There are some roosters and parakeet noise so if you are sensitive to that be aware. Walking distance to a very nice snorkeling spot. There was a little book for us to map places we would like to see that was very helpful. No air conditioning but we did not need it. Very nice breeze from the ocean. I would recommend some blinds that are a little more conducive to the amount of sun that comes in the bedroom. We had everything we needed for the beach. It was a very nice stay! 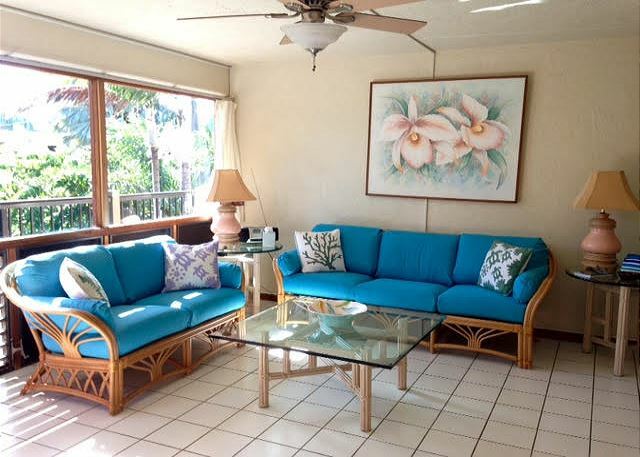 Nice unit at Prince Kuhio, with a nice ocean view from the back patio. The kitchen was nicely equipped, and there were many nice Koa wood finishes throughout. An extra bathroom made our stay smooth! 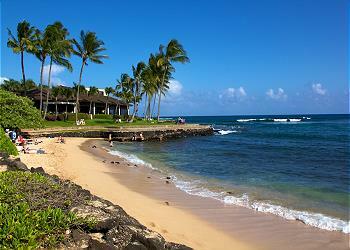 Prince Kuhio is very close to the beach, and right across the street from The Beach House, one of our favorite spots. The only thing that was uncomfortable for us were the couches in the living area -- they were too soft and not as comfy and supportive as we would have liked. ... If you want a quiet, clean place to stay away from the resorts and right across the street from the beach, then this is it! The view from the porch is perfect for drinking your morning coffee! The local parrot flock can be very loud on occasion but it's vastly entertaining to watch their antics!! Recommend this place highly! This condo is very spacious and uncluttered. Lots of kitchen appliances (buy whole-bean Kona coffee and grind it yourself! ), beach gear, and two bathrooms. 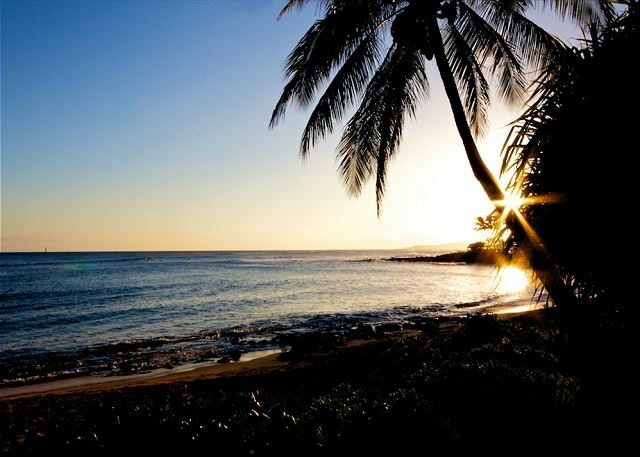 Walking distance to a great new shopping/dining mall, and to good snorkel beaches. No air conditioning, but lots of fans and tradewind ventilation. Management corrected wifi issue immediately. Thanks for the relaxing stay! Very enjoyable - have stayed here 4 times over the years, in 4 different units. Only once with W/D in unit - guest laundry is convenient. Good location next to Prince Kuhio Park with both mountain and ocean views. 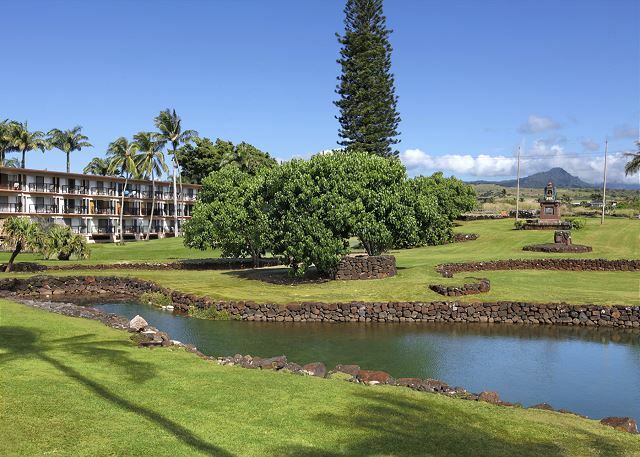 Close to shopping/dining in Koloa and Poipu. Dust off your hand dishwashing skills as no dishwasher and laundry is on first floor. Overall good deal for the location and time of year. We found our condo to be in an excellent location for our stay in Kauai. It's located on the south shore of the island which has better overall weather than other locations on the island. The condo has an excellent ocean and park view from the lanai or balcony and is conveniently located only a few minutes drive from excellent restaurants, shopping centers, hiking trails and beaches. It was exceptionally clean and included beach chairs, boogie boards and a small ice chest for outings on the beach. In addition to the great views of the park next door and the ocean, the front garden was very scenic with fish ponds, grills, tables, beautiful swimming pool and tropical flowering plants. Warning, don't park your vehicle overnight in the outside parking lot because it will be covered in lots of bird droppings by morning. There is a convenient covered parking garage next door that has a wash station in case you need to remove bird poop from your vehicle. Clean spacious and great location. Unit was well represented. Well stocked with essentials and recreational gear. If I had one comment it would be just a small welcome basket of tea and a biscuit for guests that arrive after midnight. EXELLENT,AWSOME,BEAUTIFUL,don't know what else to say. We stayed at another unit in this complex last year and this one is definitely more roomy and also has excellent crossbreeze. It was pretty ideal for our 2 week stay. We were worried that our July visit would be too hot without AC, but we never got too hot.The kitchen is nicely equipped and we really enjoyed that. We had a bit of trouble connecting to wifi and the managers quickly sent someone out to troubleshoot. We have some updating ideas for the owner(s) but overall, the place is pretty ideal within the complex. Great spot. Plenty of room. Great pool. Great view off of bedroom. Good use more kitchen items, upgrade decorations and there is no dishwasher or garbage disposal. We cooked three nights. All in all worked out well. 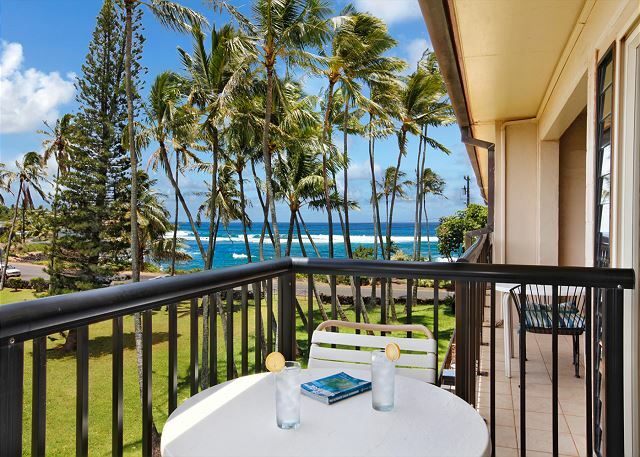 Prince Kuhio 315 is a perfect place to stay. The condo is roomy and very clean. Could use an update, but the location and views are outstanding. The ocean to your right and mountains to the left can be seen from the Patio. It is a quiet location with beautiful gardens, the staff is so helpful and friendly. The best snorkelling is just minutes from your door. We were there two weeks and would recommend this place to anyone. Excellent experience. The condo is very nice, and well maintained. 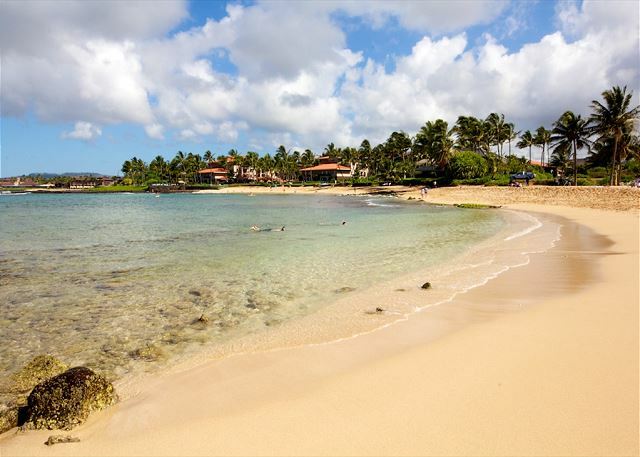 Kuhio Prine is located ideally if you like to snorkel. 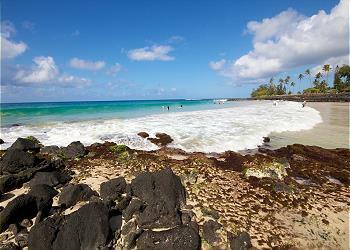 Lawa'i beach, pk beach are right there and Koloa landing is less than 5 minute walk.. The grounds and pool area are immaculate and unit 315 is spacious and clean. The view from balcony overlooking the park and PK beach makes you forget where you came from. ( probably someplace cold) the property is well maintained the unit was spotless although somewhat dated but we expected that. Groundscrew does a GREAT job and is also very helpful. I can't say enough about Prince Kuhio 315! What a great 1 bedroom suite! For starters, this is a full 1 bedroom with separate kitchen, living room, and bedroom...tons of room! A 1 bedroom with 1.5 baths is also rare as well. I loved that the kitchen was fully stocked with not only all the pots, pans, storage containers, and cooking utensils needed, but the nice touch of having olive oil, salt, pepper and other spices saved us an extra trip to the store. Speaking of nice touch, they were everywhere you looked from the little wash cloths in the bathrooms, and the skin lotion in the cabinet, to the desk with a pad and paper. All this and I haven't even reached the best part, LOCATION. First off, sitting on your balcony and watching and hearing the waves come in is epic. Total relaxation!! Being able to walk right out the door and maybe 25 yards away is a snorkeling spot where they were actually bringing snorkeling tours to. Word of mouth is this is the best location for snorkeling on the whole island. No wonder, the fish were everywhere! I even saw a turtle! An amazing restaurant called Beach House is right across the street and offers beach front dining, sunset views, with exceptional cuisine. Wow!!! I can't say enough. Thank you Prince Kuhio 315 and thank you Kauai Exclusive!!! Although it was a work trip as I live on Maui. I'm looking forward to coming back for both work and recreation with you we enjoyed the stay with you very much you're very kind look forward to seeing and hearing from you soon.